I am so in love with this chair. I’m having a hard time letting anyone actually sit in it. For one, I’m a total novice at re-upholstery, and not entirely sure this thing is going stay together. Also, it’s just so darn pretty and I don’t want it to get soiled. See the back there. I had to use different fabric because I muffed it up the first time. Pretty good match for a quick and frantic run to the fabric store before the kids got out of school. You’ll rarely ever see the back of it anyway. Not bad for a fancy little chair. I could have never found a chair like this for any less. It was hard work, but totally worth the gratification of figuring it out all on my own. Disclaimer: I am not a professional. If you need something sewn, recovered, fixed, re-finished etc, I am not the person for the job. Call a professional. They will do a better job and charge you less! I promise. This is lovely Regina. 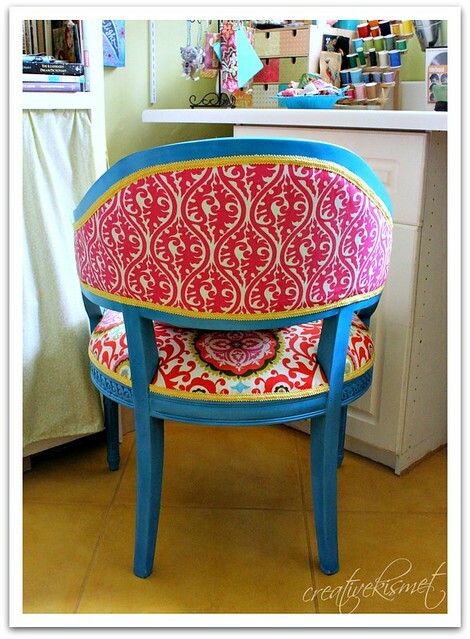 I actually like that the back of the chair fabric isn’t the same but goes really nicely. Wow, wow, wow!! This is amazing! 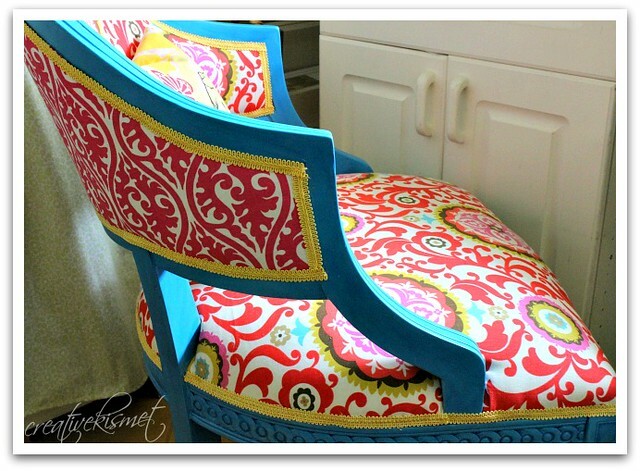 I love the contrasting fabrics, too! Happy accident. Wow! 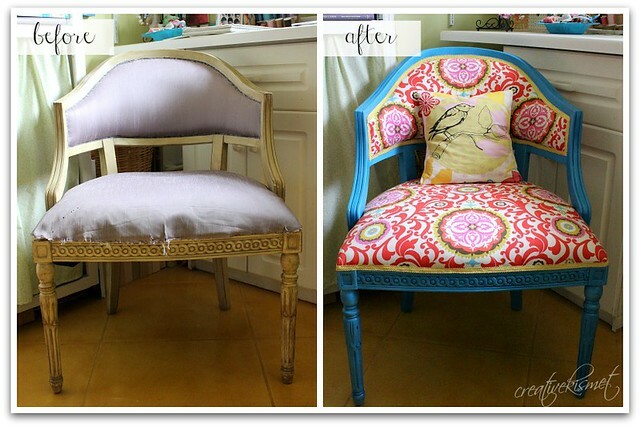 What a transformation, it’s beautiful! It’s gorgeous! You did a great job! You did an amazing job Regina. I love the colors, as far as I am concerned, you can do anything. 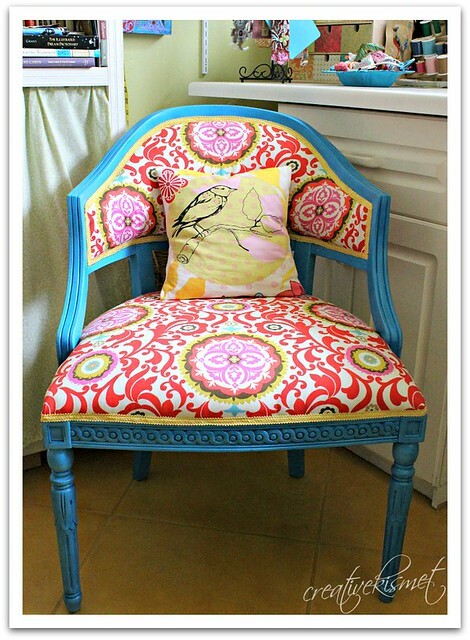 This has got to be the prettiest chair I have ever seen! Beautifully done! Holy COW!!!! This turned out gorgeous. Great job my friend! Absolutely magnificent! Love the turquoise & chili pepper red! When is your studio tour? I’ll bring brownies!!! That is such a beautiful chair! Amazing! Wow, you did a great job, especially since you claim that you didn’t know what you were doing! Great color combination too – selected with an artist’s eye. Good luck with your studio tour; can’t wait to hear all about it.